The Premiership returns for us Gooners with a match that is far harder than it looks on paper. Travelling to the home of Watford is a real test for our team, and our injury list means it is that little bit tougher. Shkodran Mustafi is part of the trinity that has earned four clean sheets on the spin. The German has injured his hamstring during the international break and is set to be missing for at least 4-6 weeks. This means a shuffle that could have ramifications for our defensive record. Nacho Monreal and Laurent Koscielny will be looking to either Rob Holding or Per Mertesacker to fill in. Then Arsene Wenger held his press conference and admitted that Laurent Koscielny is doubtful for the game. If the Frenchman does miss the game, we needn’t worry about the personnel coming in to replace him, but we should carry a little fear regarding the rhythm of our backline. A shuffle means this is sometimes lost and we cannot afford to be missing anything. Especially with a resurgent Watford lining up against that. Marco Silva has overseen a large improvement, so much so that his side have only lost one game so far. Quite impressive. They sit just one point behind us too. They are the real deal, but they can be gotten at. The solitary loss was a hammering against Man City. Watford’s defence is probably the weaker of the parts that compromises the team, and our attack can crack them, if they are on song. It is good news then, that Danny Welbeck and Mesut Ozil are both fit. Welbeck will probably be on the bench, but can Ozil get his place back in the team? Alex Iwobi has played so well since playing in the German’s stead, and if form sits above reputation, then Ozil will have to wait to get his place back. The probability is though, that Ozil will be back in. We are sitting outside the top4 on goal difference. We have recovered from the Liverpool debacle, but a mere recovery isn’t enough. Top sides go on and continue to build momentum, and that is something we must do. This game looks to be a tight one, and very much in the category of those types of game that is won even under duress. It is said to be the mark of a true team, so the result could either fill us with confidence or remind us of our frailty. 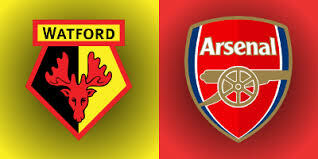 Watford won the last fixture between us, and it was at The Emirates. In fact, they have won two from the last five games against Arsenal. They have real talent in Troy Deeney, Roberto Pereyra, Etienne Capoue and especially the young Brazilian Richarlison, so it is lucky that we have the ever-reliable Nacho Monreal still fit and firing. Anything is possible with the Spaniard in the team. Now the international games are over for a while, the games for our side will come thick and fast. We have a midweek game and a Premier League game every week until after our game versus Manchester City on the 5th of November. Seven games in just 24 days. Our squad must be looked after. Every injury could cause huge ripples. Time to bust out the cotton wool. Good thing Jack Wilshere is fit…. Predicted Lineup – Cech, Holding, Mertesacker, Monreal, Bellerin, Xhaka, Ramsey, Kolasinac, Ozil, Alexis, Lacazette. ‹ PreviousOvermars as Director of Football? Not a Chance..